Commerce, Texas- Did you ever see a new product that seemed so simple and worked so well that you wondered, “now why didn’t I think of that?” For eons, I am sure, man has been experimenting with ways to get close to wildlife. I’m betting the camo patterns of early man consisted of exactly what was around the area they were trying to ambush game. When hunting in rocky country, they hid in the rocks, when in the woods, they surrounded themselves with vegetation. Armies learned that the Napoleonic methods of doing battle didn’t work so well in the woods. Soldiers in brightly colored uniform, moving in unison in line, made for an easy target. Camo became popular around the middle of the last century for military use. It’s now been perfected, at least for hunting applications. Chet Burdette, the inventor of Ghost Blind, says he was shaving one day and while looking into the mirror, he had that “now, why didn’t I think of this 30 years ago” moment! “The idea of creating a lightweight hunting blind with a conventional camo pattern on the inside and mirrors on the outside that perfectly imaged the terrain in front of the blind came to mind. We spent a lot of time with prototypes and finally designed the finished product. The Ghost Blind sets up in less than a minute, blends perfectly into the landscape and weighs only 22 pounds. It comes with built-in backpack straps.” Says Burdette. I spent a couple of days this past week experimenting with the Ghost Blind at the Circle T Bowhunting Ranch, located a few miles from Commerce in northeast Texas and owned by my friend Kenneth Tallent. Tallent is a world-traveled hunter, a member of the Mathews Bows Pro staff and one of my ‘go to’ experts in anything to do with hunting. When I met Kenneth and his ranch manager Timmy Romine at the lodge and unloaded the blind and set it up, they both were full of questions. Setting on the edge of a field near the lodge, the blind mirrored exactly what was in front of it: grass and weeds. I asked the guys to stand a few yards in front of the blind and tell me what they saw. “Nothing but grass, this thing blends perfectly with the surroundings!” was their reply. Timmy and I proceeded to set the blind up back in the woods near a tripod stand from which Timmy could film. The first afternoon, we had several whitetail deer within 20 yards of the blind, contently eating corn we had used to bait them in close. Of course, deer season is closed but I did have my bow with me and drew on a couple of them at very close range (no arrows, of course). Timmy shot video of me at full draw, aiming at deer as close as 18 yards from the Ghost Blind. The second afternoon hunt was a repeat of the first, six deer within bow range, a couple of which I was able to draw on. We both were highly impressed on the effectiveness of this new ‘mirror blind’. And back at the lodge when we reviewed the video on the big screen TV, Tallent stated the results were exactly as he predicted. 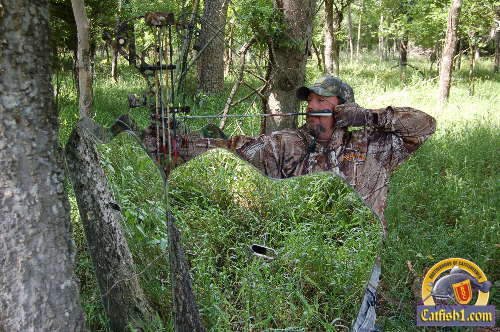 “If you control your scent properly, set up downwind of where you expect to see game, this blind HAS to work. The critters see only what is in front of the blind, perfectly natural camouflage. What could work better?” Tallent was right. Finally a light, highly portable blind where hunters can hunt safely from the ground. Since the blind opens into a semi-circle and conceals the hunter from animals approaching from the front and sides, I thought it a good idea to ‘brush up’ the sides a little with branches from nearby trees but, in practice, I truly don’t think it is necessary, providing the blind is set up with cover behind. Setting up with cover directly behind the blind also keeps approaching game from ‘silhouetting’ the hunter. The model we were using had small V’s in the top from which to shoot a rifle or bow. I think these indentions would work perfectly for rifle hunting but I hunt with a bow mostly and had to raise slightly from my seat on a folding camp stool to get a good sight picture. Wearing a face mask and camo gloves and moving slowly, I didn’t spook game. When visiting with Kevin Pottmeyer at Ghost Blind, I was informed that blinds are currently in production with rectangle shaped shooting ports, this will make the blind perfect for the bowhunter. I have plans for a return to the Circle T Bowhunting Ranch later this week, this time I will be setting the Ghost Blind up in a real hunting situation. The Fourth of July is just around the corner and it’s time to collect from fresh pork for our annual celebration and BBQ. I have no doubt my Ghost Blind will conceal me perfectly, I just have to shoot straight! For more information on the Ghost Blind, go online to www.ghostblind.com . Contact The Circle T Bowhunting Ranch (www.circletbowhuntingranch.com) at 972-529-0832.